Shahi shakar Pare is a slight variation of the traditional shakkar pare. Only it is more interesting in terms of shape, flavor, and appeal. 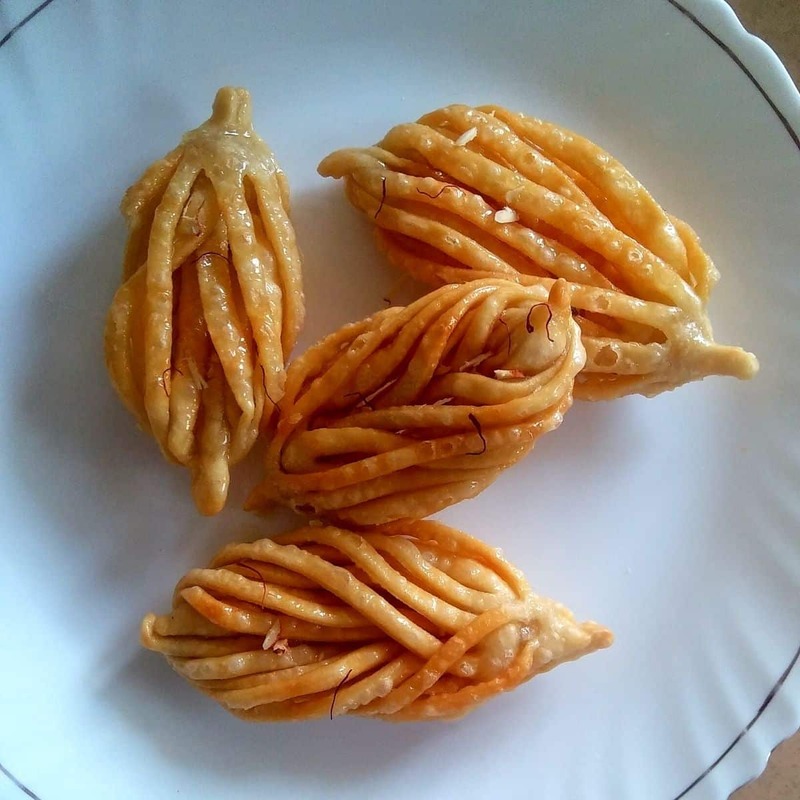 It is a crispy mildly sweet Indian snack, prepared mainly with all purpose flour/maida, ghee, and sugar. The festive season is around the corner. It seems like it has all begun in full swing. It can’t be complete without making some sweets and savoury snacks. Isn’t it? And this leafy shahi shakkar pare will surely surprise your loved ones. So let’s prepare this. Assemble refined flour, ghee, and salt together in a shallow bowl. Mix very well by pressing with your hand for 2-3 minutes. Add little amount of water at a time and knead to make a smooth but stiff dough. Now spread a few drops of ghee to avoid drying from outside. Cover and keep it aside to rest for 20 minutes. In the meanwhile heat a pan. Add sugar, and water together. Keep the flame over low to medium and stir until the sugar dissolves. Now add saffron strands and cardamom powder. Stir and cook until you get a one thread consistency. You can take a drop and check with your fingers. Add lime juice to avoid crystallization of sugar and turn off the flame. Knead the dough again for another minute. Now divide the dough into equal portions. Then take a portion, dust some all-purpose flour and rolled it into a thin oval shape. Now make cuts in the middle of the sheet (exactly shown in the picture). Brush a little water at the edges of one side. Now fold two times and slightly press to seal the edges of one side and make a leaf-like shape. Now fold that side reverse through the middle of the leaf and seal it by creating slight pressure. Then slowly attach two edges of the other side to give it a complete look of the leaf shape. Heat oil in a pan. Once oil becomes hot, reduce the flame to medium to low and add the leaves 4 to 5 at a time. Fry from both the sides until both sides become slightly golden. Once done remove from oil and keep them on an absorbent paper. Follow the same process until all done. Then put one fried leaf to the warm syrup and coat both the sides within 2 seconds. Then immediately take it out to another plate. Follow the same process with the rest of the leaves. Serve the shahi shakkar pare by adding chopped nuts on top. section. Also, you can connect with me on Instagram, Facebook, Pinterest, and Twitter. This is such a pretty shakarpale design Geetanjali and your photos help to know how to make them. Great share! Gorgeous, gorgeous, gorgeous!!! Love the way you have patiently explained in detail! Need to try this (shakarpare is my favorite) but hmmm, must see whether I have the same patience as you had 😀 Fabulous share dear! What a lovely Shakkar Para design Dear. Brilliant job. Bookmarking this recipe for upcoming Diwali. Thank you! How pretty this shahi shakkar pare looks, you have loads of patience to make this much cute looking shahi shakkar para. Too tempting to the core. The shakkar pare look so artistic ! Beautifully done !! Awesome share ! Amazing share. Beautiful tutorial pics. Thanks for sharing so detailed recipe. Looks wonderful. Never seen such beautiful and tempting shakkar pare. Oh my!! Look at that beautiful shape of the shakarpara; such an artistic piece of deliciousness. Absolutely loved the share. wow Gitanjali this is so creative fold. And shakarpara looks so tempting. I will surely try this, my kids will love eating it bit by bit. Love the way you have added these step by step pics. I am sure anyone who is trying will appreciate these as a guide. Gitanjali, I love the way you have added these folds. If you serve me these shahi shakkarpare, rather than eating them I would keep staring them as these are so beautiful to eat 🙂 Kudos to you girl, you have made them so perfectly. Shahi Shakkar Para looks so gorgeous Gitanjali!Beautifully explained.Fab share !